I met my friend Pam at the stables this afternoon to go riding (that’s Pam’s arm in the photo!). We ride the stables’ horses and it is a bit like Forrest Gump’s box of chocolates in that you never know what horse your going to get. Today Pam got Duf and I got Beau. 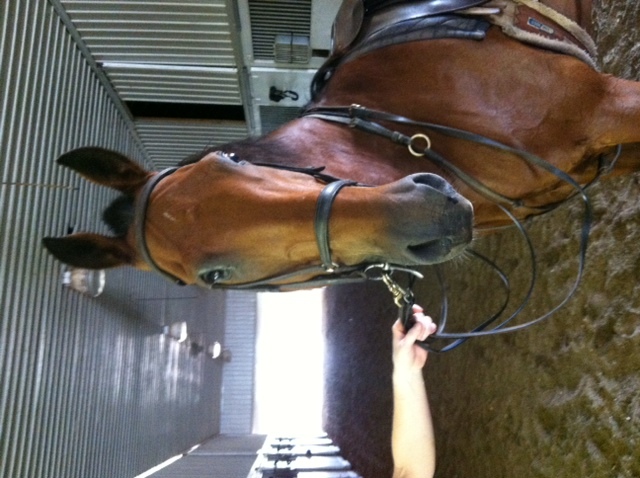 Beau is not the most handsome horse at the stables but he is my favorite! A lot of people don’t like riding him as his trot is awkward; I felt that way once too, but I have long since figured it out, and his canter is beautiful. Beau, the best chocolate in the box! This entry was posted in Uncategorized and tagged horse, horseback riding. Bookmark the permalink.